Italy offers an amazing range of rosé wines, the permutations of which are like those of no other country in the world. 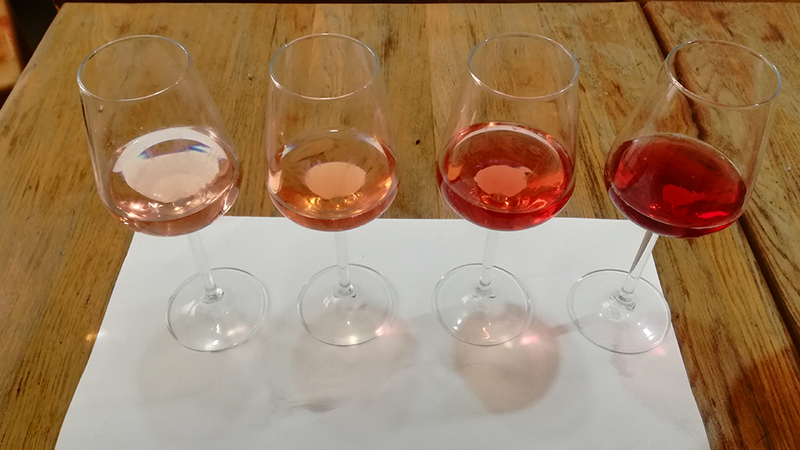 In “Looking at Italy Through Rosé Tinted Glasses,” published on Vinous in June of 2015, I described the remarkable gamut of pink wines made in Italy. In fact, while any pink wine in Italy is generically called Rosato (rosa or rosato is Italian for pink), there are actually many different kinds of Rosato wines made in the country. These can range from ultra-pale Chiarettos typical of the Lake Garda area to slightly darker Piedmont, Tuscan and Puglian Rosatos (the latter region is mainly famous for such wines, especially from the central Castel del Monte area and the southernmost part of the region called Salento), to the darkest of all Italian pink wines, the famous Cerasuolo d’Abruzzo. Normally, Italy offers many delightful Rosato wines every year and it’s no different in 2017. However, the relentlessly hot growing season of ’17 posed huge challenges for – and required tough decisions by – winemakers and winery owners. Many winery folks decided to pull the trigger early at harvest time in order to preserve acidity in their fruit but in so doing some picked grapes that had not yet reached full physiological ripeness. Wines made with such grapes invariably taste tough owing to generally gritty tannins. Other wines are aromatically compressed because of the heat that burned off aromatic precursor molecules, and so the wines lack the perfumed exuberance of Italy’s best Rosato wines from cooler years like 2014 and 2016. 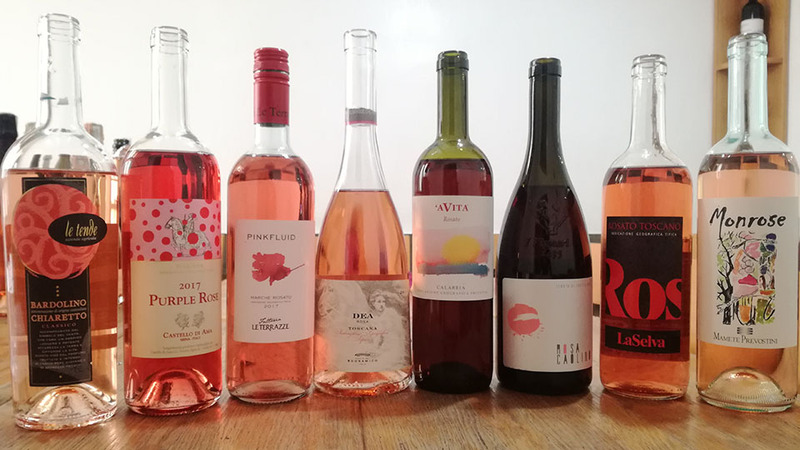 Another problem (this one independent of vintage considerations) is that, in many cases, estates seem to be just going through the motions with their Rosato production: as pink wines are currently fashionable, many wineries have jumped on the bandwagon. However, these wines are often devoid of interest – too bland, soft and sweet. One of the explanations for this problem is the widespread use of aromatic commercial yeasts, which tend to introduce the same aromas in Rosato wines made all over Italy, regardless of the sites the grapes grow in and the varieties themselves. Uninteresting wines that are soft and sweet and smell of banana, hard candy and bubble gum can be found practically in all regions, and this is a shame. That said, there are areas of Italy in which Rosato production is an integral part of tradition and history, and so it is these areas that almost always are the top sources for Italy’s best pink wines. Puglia’s Salento, Abruzzo’s Cerasuolo wines (do not confuse them with Cerasuolo di Vittoria, a Sicilian red wine) and the Chiarettos of the Lake Garda area offer the largest number of outstanding still Rosato wines. In fact, positive surprises are in store for wine lovers all over the country: for example, there are many outstanding wines to be had from numerous Italian regions, such as those made with Aleatico (an aromatic variety that can give intriguing, penetrating Rosatos) in Tuscany, Puglia, Marche and Lazio; those made with blends of Nero d’Avola, Nocera and Nerello Mascalese from Sicily’s Faro area; Piedmont’s many Nebbiolo and Nebbiolo-based pink wines; and many wines from Sardinia made with that island’s various red grapes. Clearly, there are also many superb pink sparkling wines, and both Trento and Franciacorta wines can be exceptional. Last but not least, don’t forget that some producers are, plain and simple, Rosato specialists. You will rarely if ever be disappointed by any pink wine you buy from the likes of, Bonavita (Sicily), Cataldi Madonna (Abruzzo), Le Cinciole (Tuscany), Le Pianelle (Piedmont), Le Fraghe (Veneto), Le Terrazze (Marche), Leone De Castris (Puglia), Maso Martis (Trentino), Praesidium (Abruzzo), Rivera (Puglia), Rocca di Montegrossi (Tuscany), Tiberio (Abruzzo), Valentini (Abruzzo) and Vallone (Puglia). Readers might want to keep in mind that the names on that list comprise a real “who’s who” of Italian rosé production, although of course I am almost certainly omitting a few other worthy sources. I tasted the wines in this report in my office in Rome in April and May of 2018.